Three-cylinder diesel power makes this Cushman a tough contender in the rough. A new three-cylinder diesel 4X4 utility vehicle is the latest in Cushman's lineup of equipment and comes named 1600XD. The 22 horsepower machine drives through a CVT transmission with low and high ranges and a user selectable locking rear differential. It sports four-wheel independent suspension, and carries a maximum load of 1,600 lbs. The 1600 rides on a welded steel powder-coated frame and comes with a tubular steel ROPS and three-point safety belts. Dual beam headlights allow for work in the dark, and a 12-volt accessory in the dash allows for charging phones, GPS, etc. 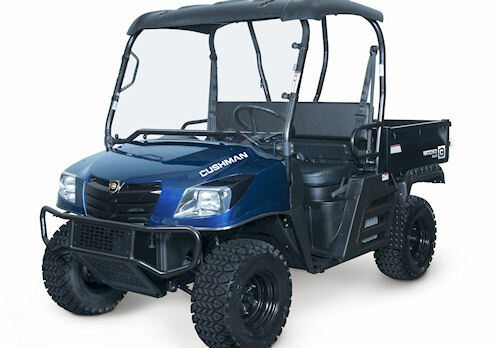 The new Cushman 1600XD 4X4 utility vehicle is a 22 horsepower diesel, 4WD, with a continuously variable transmission with low and high gear ratios. The new Cushman also accepts an optional 6.5 gallon per minute hydraulic power source to drive plows, augers and post drivers. For more information on the machine, visit www.cushman.com/1600/XD.